Davidson admitted he played up to "the worst of his perceived image"
Comedian Jim Davidson has left ITV1's Hell's Kitchen after making what the channel called "unacceptable remarks". 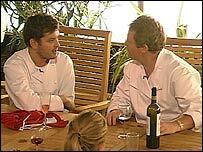 His departure from the cookery reality show followed a row in which he used a gay epithet in the presence of fellow contestant Brian Dowling. Dowling objected to the term "shirt lifter," which he called "really rude". 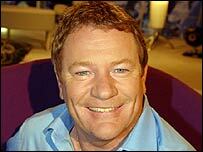 An ITV spokeswoman said producers had asked him to leave the show. "ITV does not condone comments which could cause offence," she continued. In a statement released after his exit, Davidson said "the moment was right to leave" but denied he was a homophobe. Seven contestants remain in the show, which sees two teams of celebrities compete to impress award-winning chef Marco Pierre White. Monday night's edition reached a series high of 4.5 million viewers, according to overnight figures. The row began after Davidson complained about a "look" he'd been given by a table of diners. "Why do shirt lifters pull that same face?" he said, prompting Dowling to call him the "most offensive person he had ever met". The comedian later accused his fellow contestant of "playing the homophobic card". In his statement, Davidson admitted the show's pressurised atmosphere "did make me play up to the worst of my perceived image". "People who know me know I am not homophobic," he continued. Viewers of Tuesday's programme will see Davidson describe himself as "a non-PC fossil". "It wasn't my intention to offend and I am wrong," he is shown saying. Broadcasting watchdog Ofcom said it had received 46 complaints over Davidson's "bullying" of Dowling. Marco Pierre White's use of the word "pikey" in an edition of the programme last week had prompted 30 viewer complaints, it added.